I was in the mood to cook something more elaborate this Saturday than has been my habit recently, and it was a cold, rainy, windy day, calling for serious comfort food, so this was an obvious choice. I picked up a jar of the Spicy Coffee Spice Rub (which is also available from Zingerman’s Mail Order), and some Benton’s bacon, from Zingerman’s Deli, and the rest of the ingredients from a locally-owned grocery store called Arbor Farms, which I really like because it specializes in organic ingredients and also in gluten free products. The recipe was not difficult, in that it did not involve any tricky techniques or extra-careful cooking; it just had a lot of ingredients and several steps. First I did a lot of chopping, and here’s my assembly of the ingredients, except the chicken. For the hot pepper flakes I used my own, from some tiny round hot peppers I grew last summer. The garlic I grew also, as well as the parsley, which is still thriving in my front yard – it will withstand the frost for a little while. The bread is gluten free, which Arbor Farms buys from a bakery in Toledo. I did skip a step, in that I did not need to pre-cook any bacon; I already had a jar of bacon fat, of exclusively artisanal bacons from all my experiments, so I was confident I had some tasty fat already. I put the melted bacon fat in the bottom of a pyrex dish, and lined it with the bread, and meanwhile cooked up the onions/celery/apples/currants/lemon zest/hot pepper flakes/other spices. Then I put the apples/onion mixture over the bread, and prepped the chicken, rubbed on more of the melted bacon fat, and the spicy coffee spice rub, and poured the lemon juice over. And last, laid the strips of Benton’s bacon on top. I pulled the chicken off and let it rest on a cuttingboard for 10 minutes, and meanwhile broke up the strips of bacon onto the “stuffing” and then served the stuffing onto plates. Added pieces of chicken (and some of the veggies we roasted on the side), and enjoyed a fabulous dinner. Was rich, spicy but not too hot, complex flavored and all-around good. I will make it again. It is not a dish to make when you’re pressed for time though. The full recipe is below, enjoy! My friend Lex Alexander turned me on to this recipe about 10 years ago. It’s in Zingerman’s Guide to Good Eating and has become one of the staples of our catering work here at Zingerman’s. 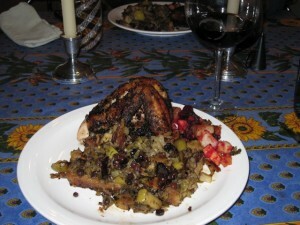 I loved it from day one because it’s such a nice way to make a mini-Thanksgiving dinner without having to spend two days cooking: the chicken juices drip down on the bread beneath it in the roasting dish, essentially creating a low-labor but high-flavor version of stuffing (which I love!). In working on this book it dawned on me that getting bacon involved in the dish would be a big win. So here it is, Lex’s chicken take two . . . this time with bacon. I also decided to add a spice rub that Roadhouse chef and managing partner Alex Young did for Esquire magazine a few years ago. Zingerman’s Spicy Coffee Spice Rub is a blend of ground Roadhouse Joe coffee, Urfa red pepper from Turkey, Tellicherry black pepper, cloves and sea salt. I really like the coffee, clove and bacon blend of flavors—in some strange way it makes me think about a spicy, exotic version of red eye gravy. It’s appropriate, too, since Lex’s current life revolves a lot around the very fine coffee shop—called 3 Cups—he owns in Chapel Hill, NC. Having tried the dish with a number of different bacons, we settled on Allan Benton’s—its big smoky favor and silky fat served the dish well! It should probably go without saying, but the better the chicken, the better the dish. I use free-range birds we buy from Amish farmers in Indiana. The chicken smells great in the oven, too — the aromas of roasting chicken and bacon both make me want to eat as soon as the thing starts cooking. 1/2 loaf leftover country bread, such as a good crusty white country loaf, sliced 3/4-inch thick. If the bread is still fresh and soft, slice it and let it dry on the counter for a few hours before using. 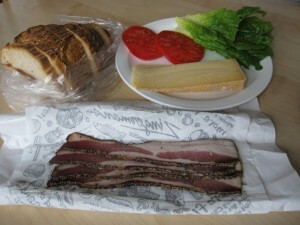 Arrange 6 of the bacon slices on a 1/4-inch-deep baking sheet. 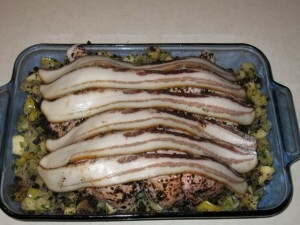 Bake for 20 minutes, or until the bacon is crisp and most of its fat is rendered. Remove the baking sheet carefully from the oven. Drain bacon on paper towels and reserve for another use. When the fat cools a bit, pour into a Pyrex measuring cup. You should have about 1/2 cup. Heat 1/4 cup of the fat in a large skillet over low heat. Add the onion and celery. Cover and sweat, stirring occasionally, for 15 minutes or until soft. 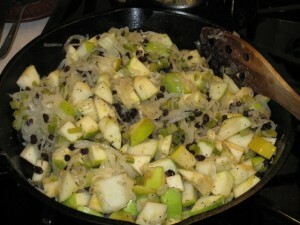 Add the apple, currants, garlic, thyme, red pepper flakes, lemon zest, salt and black pepper. Stir to mix. Cook, covered, until the onions and celery are translucent, about 5 to 7 more minutes. Remove from heat, stir in the parsley, and set aside. Layer the onion mixture atop the bread. Place the chicken, skin side up, over the onion mixture and bread. Rub it with 2 tablespoons of bacon fat and 4 tablespoons of Coffee Spice Rub. 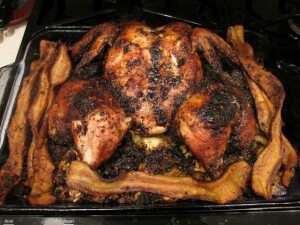 Pour the lemon juice over the chicken, then lay the remaining bacon slices across the top of the chicken. Place the entire dish in the oven and cook, uncovered. After 45 minutes or so, check that the bacon has crisped on top of the chicken. 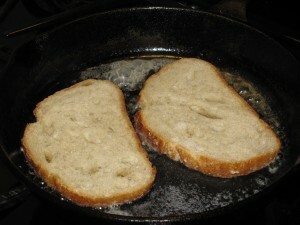 Once it has, pull it off the chicken and lay it directly onto the bread mixture so the chicken can brown. Change the oven function to broil, but continue at 400 degrees F. The chicken should be done in 15 to 20 minutes: the skin should be nicely crisped and its juices should run clear when the bird is pricked with a fork. Remove the pan from the oven. Sprinkle the whole dish with 1 tablespoon Coffee Spice Rub and let stand for a few minutes. Remove the chicken to a cutting board and cut into quarters. 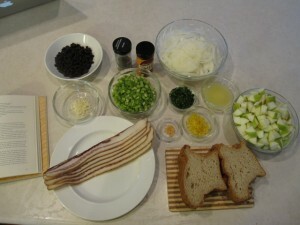 Draw a sharp knife through the bacon, bread and onion mixture to break it up. Spoon some of the mixture onto each plate and place the chicken on top. 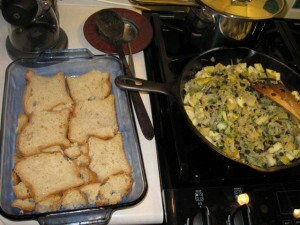 Tonite’s culinary foray was American Fried Bread. (Yep, my hubbie is away for the weekend again, a good time to cook with gluten!) It sounds plain. And for sure it is simple, but too good tasting to be plain, due to really good bread, bacon fat from a flavorful dry-cured artisanal bacon, and real maple syrup drizzled over. For bacon I had three slices of Edwards bacon. Sliced medium-thick, and so long that they can’t fit in my largest skillet! And since they aren’t pumped full of water they did not really shrink, so in the end I cut them in half so the outside ends could be moved into the middle. I used a couple of slices of Zingerman’s farm bread, which was fresh but I put the slices out on the counter for a couple hours to “stale” them up a bit. 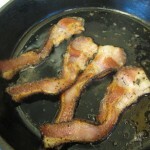 Edwards’ bacon I find, I am particularly prone to overcooking. Still very edible, just crunchier than I mean for it to be. I pulled out the bacon, and in went the bread, and after a minute, I added 2 tablespoons of milk, too, which hissed and bubbled in the hot pan, and sprinkled the bread with a bit of salt. The first side got a lot more fat than the second side, but I did not add any more, I figured the first side had absorbed plenty for both! The cooking time was short of course. In the meantime, for a side dish I was also heating up some beets, and kale, from my garden, which I had cooked the night before. 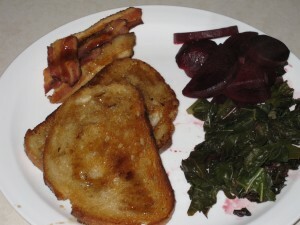 When toasty on both sides (the first side completely golden brown from all that bacon fat, and milk too I suppose, and the second side toasted in areas), I removed the bread from the pan, drizzled it and the bacon with real maple syrup, and ate while hot. I ended up putting the bacon on top of the bread. It was a little decadent feeling, but holding firmly in mind that bacon fat from well treated, naturally raised pigs is better for you than butter, I told myself it was not THAT decadent, really. And its great comfort food. This recipe is written up on page 162 of Zingerman’s Guide to Better Bacon, but I’ve covered all the specifics above. Ari does suggest using Zingerman’s Roadhouse bread (also known as Thirded Bread or Rye ‘n’ Injun bread in the 18th and 19 centuries) if you can get it! It’s a rainy October Saturday, and my husband is off on a weekend backpacking trip. Normally I would be too, but my dining room table was literally covered with Roma and Brandywine tomatoes that I picked in a hurry before a hard frost on Wednesday, and I was itching to make a batch of sauce and can it – it takes ages and I knew I would not have time to do it on a weeknight. So, I stayed home, and made my sauce. 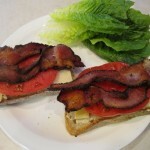 And all that to say, it’s also a great opportunity to make some rainy-day comfort food for lunch that needs really excellent Brandywine tomatoes – yep, a BLT. 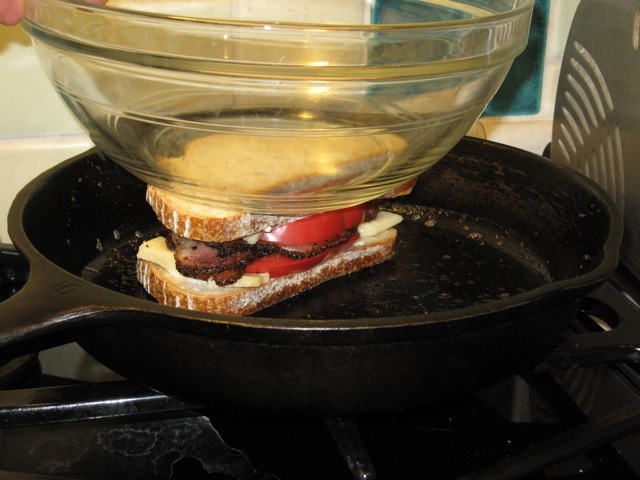 And not just any old BLT – the TLBBLT. It’s a simple sandwich, but I’m a firm believer in the concept of simple but excellent ingredients giving extraordinary results, and this was outstanding. Here’s my ingredients, except the Hellman’s mayo which I forgot to put into the photo: 4 slices of Arkansas peppered bacon, some aged Cabot farmhouse cheddar, a couple of slices of one of my homegrown Brandywine tomatoes, some organic romaine lettuce, and two slices of Zingerman’s Bakehouse’s farm bread. And put it in the pan in the remaining bacon fat and weighed it down with a bowl. (This was a bit tricky in that my bowl was large and kept tipping, but on the whole it seemed to work well.) Flipped it over when one side was golden brown, cooked it another few minutes til also golden brown. Then I pried it apart and added in the lettuce, cut it carefully and at a slight angle (Laurel would be proud I think, though I’ve never met her), stepped back to admire it, and then devoured it immediately. Was a perfect combo of textures and flavors – the crunchy bread and chewy bacon, soft juicy tomatoes and melted cheese – oh my. If I weren’t so full I’d do it all over again. Aside from being the only palindromic recipe name I know, this also makes a really good sandwich, which has long been very popular at the Deli. It’s named for Dr. Laurel Blakemore, horse fanatic, show jumper, pediatric orthopaedic surgeon and a big lover of bacon. 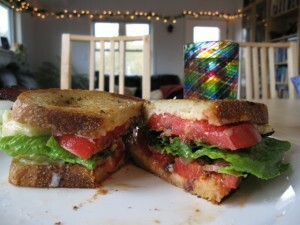 It calls for a good bit of mayonnaise—I think a good BLT needs that, but you can certainly cut back if you like. Either way, it’s easy to make and great to eat! The recipe is for a single sandwich but it’s not hard to do the math and make as many as you want. 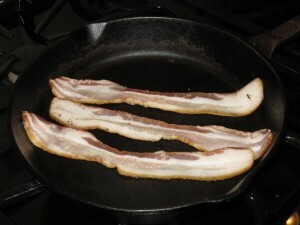 Cook the bacon in a frying pan until done. Remove from pan and drain, but leave the pan on the heat. Spread mayonnaise on both slices of bread. Put a slice of cheese on each slice, then add the bacon and tomato. Assemble the sandwich, give it a gentle press together with your palm and slide it into the hot pan. Weight it down with a bowl and fry until golden brown. Flip, brown the other side, and remove from pan. Add the lettuce, cut the sandwich on whatever angle your heart desires (remember, though, that Laurel is a surgeon and places great value on properly positioned knife cuts! ), and eat it while it’s hot!